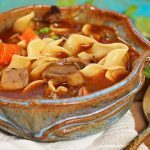 Beef noodle soup is a big hearty stew packed with tender, slow-cooked beef, vegetables and egg noodles. It's easy to make, full of flavor and delicious! 1 tsp steak seasoning I used Montreal Steak Seasoning - use your favorite! Begin by peeling and dicing the onions, mushrooms and carrot. Mince the garlic, dice the beef, removing any excess fat. Heat a large stock pot over medium heat. When hot, add the butter and garlic. Next add the sliced mushrooms, diced carrots and onions, season with steak seasoning. Saute for five minutes. Add the minced garlic and saute for about a minute. Now add the beef stock and bring to a simmer. Add the roast beef and continue to simmer for 15 minutes or until vegetables have softened. Bring to a boil, then add the egg noodles and cook according to package directions until just al dente. Remove from the heat, stir in the frozen peas. The heat from the soup will warm and cook them perfectly. Stir in a handful of minced parsley (if desired). Serve and enjoy!